A well-known Yellowstone National Park wolf was shot in April, according to preliminary results from a necropsy, prompting authorities to ask the public for any information that would lead to the shooter and offering a $5,000 reward. Hikers discovered the wounded wolf on April 11 inside Yellowstone National Park near Gardiner. Park staff euthanized the animal due to the severity of its injuries. The wolf's body was sent to the U.S. Fish and Wildlife Service Forensics Laboratory in Ashland, Oregon, for a necropsy. 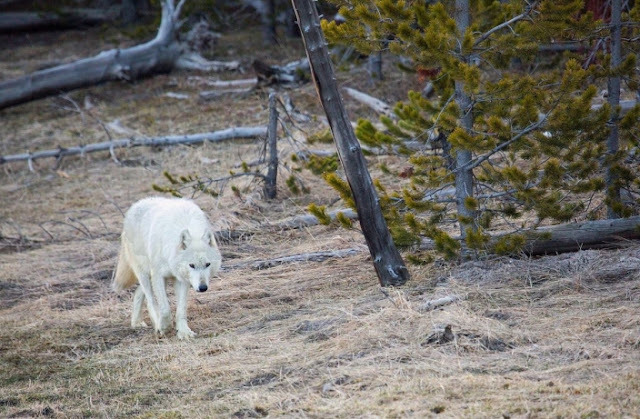 National Park Service law enforcement believes the wolf was shot while on the north side of the park, near Gardiner, or near the Old Yellowstone Trail, which is in the park on the northern boundary. The incident likely occurred sometime between April 10 at 1 a.m. and April 11 at 2 p.m.
“Due to the serious nature of this incident, a reward of up to $5,000 is offered for information leading to the arrest and conviction of the individual(s) responsible for this criminal act,” said Dan Wenk, Yellowstone National Park superintendent, in a press release. It is the first time a wolf has been shot in the park in at least 10 years, as far as park officials are aware, said Morgan Warthin, a public affairs specialist with the park. As the alpha female for more than nine years with the same alpha male, she birthed at least 20 pups, 14 of which lived to be yearlings. She was one of the most recognizable wolves in the park and sought after by visitors to view and photograph. Responses to "$5,000 reward offered for information in illegal killing of famous She Wolf"
An evil human murdered this beautiful queen wolf. Disgusting and horrible. RIP beautiful shewolf mother.